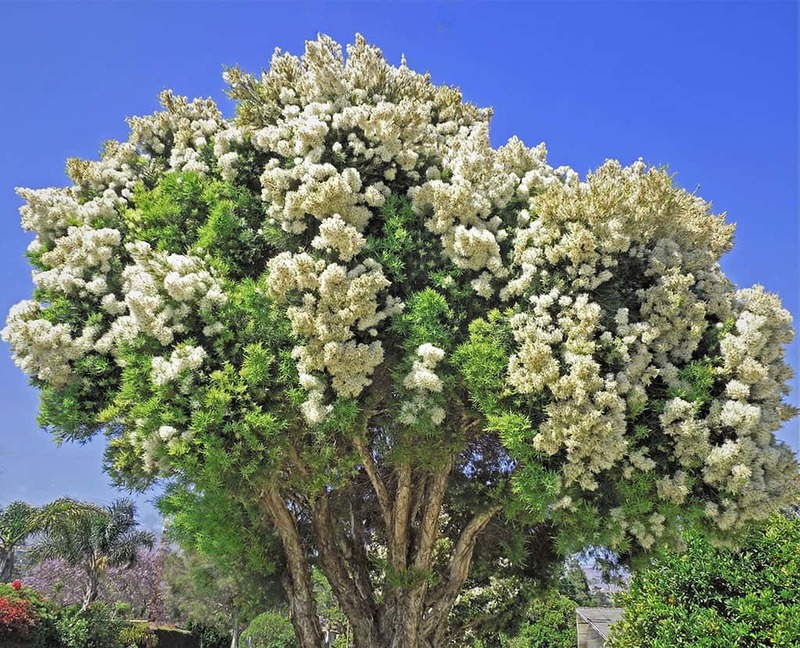 What a surprise it is to see this tree in Santa Barbara in June or July, since it appears to be covered with freshly fallen snow – hence the common name, “Snow-in-Summer”! Its honey-scented flowers occur in fluffy white clusters made up of many 1½ inch long flower spikes – and they are so dense that, from a distance, they appear to be a solid blanket of snow. Snow-in Summer grows quickly, and depending upon pruning, can be kept as either a large shrub or a small tree. As a tree form, when young, it has a willowy growth habit that later develops into a broad, dense, umbrella-like crown 20-30 feet tall by 20 feet wide. Its smooth, soft, dark-green leaves are 1½ inches long and 1/8 inch wide. Its dull-white bark is rather spongy and shreds off in paper-like strips – which is why it is also commonly known as “Flaxleaf Paperbark”. Its botanical name is Melaleuca linariifolia. Melaleuca is derived from the Greek words, “melas”, meaning black, and “leukos”, meaning white, referring to the black marks on the white trunks of some trees, which can be the result of age or, in their natural setting, fire. The species epithet, linariifolia, refers to its linear leaves. This tree is very adaptable to a wide range of growing conditions. It can tolerate dry to poorly-drained soil, but certainly grows best with some watering in our drought. It is easily propagated from seeds and is low-maintenance, requiring little care after it reaches maturity. Snow-in-Summer is native to coastal areas of southeast Australia, where it is commonly used as a decorative landscape tree, because of its outstanding floral display and its general heartiness – remarkable qualities that Santa Barbarians have long appreciated in this lovely tree found on city streets or in private gardens! 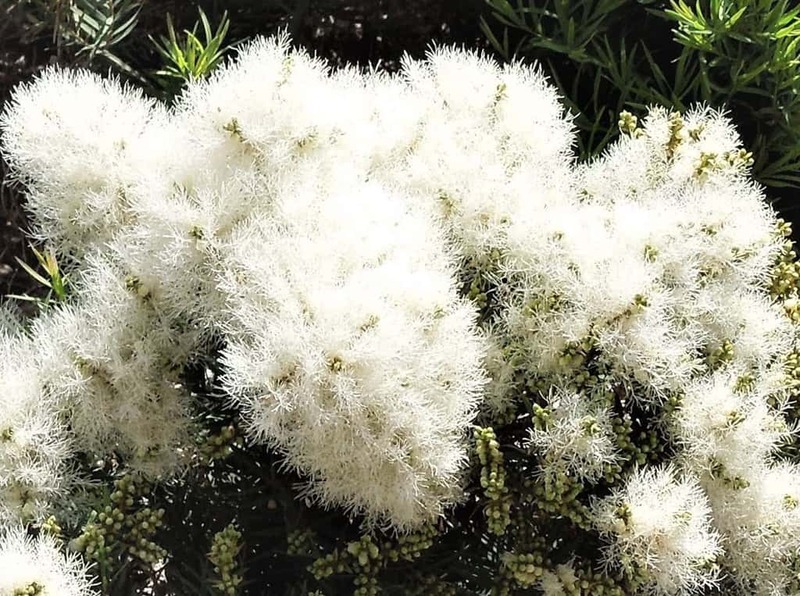 Snow-in-Summer Trees can be seen in the 1000-1300 blocks of East Carpinteria Street, and in the 700-800 blocks of Gutierrez Street, intermixed with other Melaleuca species.